The maxim “Primum non nocere” is almost as old as the practice of medicine. In combination with the principles of beneficence, autonomy and justice, and whilst keeping in mind the confidence and dignity of the patient, it should constitute the basis of our behaviours as physicians and nurses.Since diagnostic and therapeutic interventions have become more complex and their risk/benefit ratios more difficult to assess, the importance of safety and quality of care rises. Avoiding the infliction of harm on our patients has moved into the focus of clinical medicine. Patient safety is now viewed as a priority even by the Presidency of the European Union.Physicians in intensive care medicine deal with the most fragile and dependent human beings, often struggling with multiple co-morbid diseases and physiological derangements at the limits of survival. These patients are often reliant on numerous invasive technologies for their survival. Moreover, the almost universal need for multiple pharmacological interventions – combinations of which have often never been rigorously tested before – places the critically ill patients at a very high risk of being harmed by the physician’s interventions.More than 120 internationally known experts introduce their current knowledge of patient safety and quality of care in intensive care medicine in over 50 chapters covering the following fields:- Safety in intensive care medicine- Decision making- Culture and behaviour- Structure and processes- Protocolised medicine- First, do no harm- Safety during technical support- Training, teaching and education- Risk management- Ethical issues- Future approachesThis book should be read by every manager who has responsibility for the acutely ill. 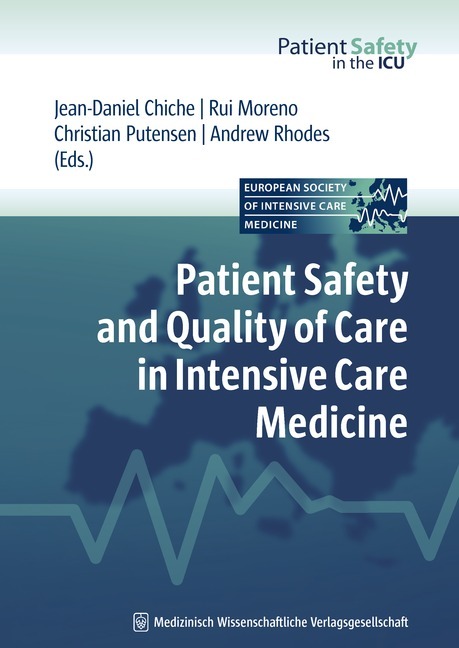 It is an invaluable educational and reference tool for physicians and nurses in intensive care medicine and will help to improve the safety and overall care for critically ill patients.